One of the key figures in bringing an intense gospelish vocal delivery to rock ‘n’ roll on a succession of hits in the late 1940’s and early 50’s who has become far more renown in the years since for being the primary influence on Little Richard. Wright was born in 1932 in Atlanta, Georgia and by his teens had received his primary education through watching shows at Bailey’s 81 Theater in town. It wouldn’t be long before the openly gay youth was on stage himself, as both a dancer and a female impersonator, a role that was so common in this era of black theater that it was one of the first examples of a societal acceptance of homosexuality in America. During the warmer months the “Tent Shows” that featured this brand of entertainment traveled everywhere east of the Mississippi River, from the Canadian border to the deepest south, then each winter they would take up residencies in the local clubs. It was there that he found himself propelled to stardom when performing on a bill with Wynonie Harris, Charles Brown and Paul “Hucklebuck” Williams, who was so impressed with Wright that he called his record label, Savoy, and recommended they sign him. Producer Teddy Reig inked him to a contract almost immediately and his first release in the summer of 1949 became a national hit. 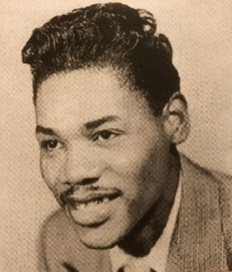 With his gospel infused tenor voice, songwriting skills and highly dramatic delivery Wright added yet another prototype to the growing rock field and during this time met Richard Penniman who quickly emulated the rising star’s look, complete with pompadour and make-up, as well as his vocal technique. A few years later it was Wright who got Richard his first recording contract in 1952 thereby launching the career of one of rock’s greatest artists. The hits on Savoy kept coming through 1951 as Wright also became one of the most reliably explosive live acts in rock, his flashy looks (complete with gold teeth), and emotive testifying bringing down the house on the chiltin’ circuit. His effect on audiences at the time was captured on a rare recording of him performing at The Apollo Theater in 1952, one of the few existing live documents of that era of rock ‘n’ roll. Yet by that time his hits had dried up and in 1954 he and Savoy parted company. He wound up at Peacock Records run by the notorious Don Robey out of Houston, which ironically is where Little Richard was recording at the time. Neither was able to get hits, but Wright’s records were just as powerful as ever while some of his best sides never saw the light of day. When Richard became a star in 1955 on Specialty his mentor’s career as a recording artist was all but over, save for a few sides issued on increasingly minor labels towards the end of the decade. That’s when Wright resumed his club career, primarily as a performing MC in Atlanta. He was slowed by a series of strokes in the 1980’s and died in 1991 at the age of 59. For a brief time Billy Wright was rock’s most notoriously flamboyant star, the vital link back to a style of showmanship yet to be corrupted by white America, one which helped to shape rock ‘n’ roll. But it was his protégé who had better timing, ironically by coming into his own just as white kids were picking up on the sounds of black rock ‘n’ roll in the mid-1950’s, leaving Wright a mere footnote in the career of a much bigger star.